No, it is not Jesus of Nazareth Part I, although the cover looks almost identical. Rather, it is a collection of seventy addresses given by Pope Benedict during his public audiences from March 2007 to December 2010. This volume is entitled Great Christian Thinkers: From the Early Church through the Middle Ages, and it is published by Fortress Press, a Lutheran publishing house. 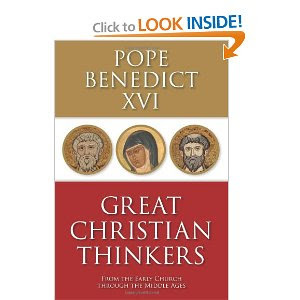 It covers the great Christian thinkers from Clement of Rome to Julian of Norwich. The volume comes in a very flexible softcover and each page is well laid-out. There are 316 total pages. I mention this volume, primarily, due to it being published by a Protestant publisher. Quoting from the Publisher's Foreword: "It is a matter of particular pride at Fortress Press that we offer this compilation of brief portraits composed and presented by Pope Benedict XVI on key figures from Christian history (ix)." The foreword goes on to say that this volume contains "a set of seventy expert and reliable yet quite accessible introductions to the key framers of the pre-Reformation tradition, East and West, as useful for personal reading or study as for classroom or congregation (ix)." Quite an endorsement if you ask me! Some have referred to Pope Benedict as the "Pope of Christian Unity" which I think is quite true. Projects like this can help, perhaps only in a very small way, heal the wounds that divide Christendom. The editors from Fortress note that they were "grateful to the Vatican Library Press for their enthusiasm for the project and willingness to facilitate it by providing lucid and accessible translations (ix)." Sounds great but I am gonna play Devil's Advocate for a moment...do we know if the addresses are edited? I say this because I once bought what I thought was a great edition on Church Fathers by Intervarsity. Upon reading I saw that much of their "catholic-friendly" interpretations were ommited. On the question of B16 and Church Unity...I wonder why he did something that the theologically-pissed off the Orthodx: eliminating the papal title of "Patriarch of the West"? That's a rather ancient title with deep Church history significance to eliminate. Nope, these appear to be the actual audiences from B16, in English. * In this Ignatius volume there are addresses on "Monastic Theology and Scholastic Theology," "The Cluniac Reform," "The Cathedral from the Romanesque to the Gothic Architecture: The Theological Background," and "Rupert of Deutz," all of which are missing from the Fortress volume. * Similarly, numerous addresses from this volume are missing. By the way, I would also like to mention that Fortress publishes a number of Catholic volumes. For example, this book (which I have not read) looks quite interesting.